As long as there are buyers and sellers, a Market order will be matched and filled immediately. Market order is the quickest way to buy or sell your tokens. Once received by system, a Market order will be matched and filled right away as long as there are buyers and sellers on the Order Book. 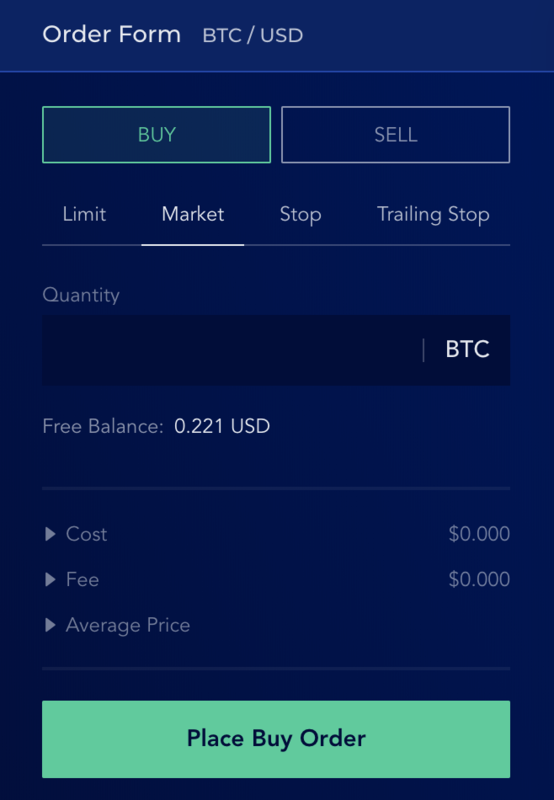 Using Market orders to trade means you accept to trade with market price. 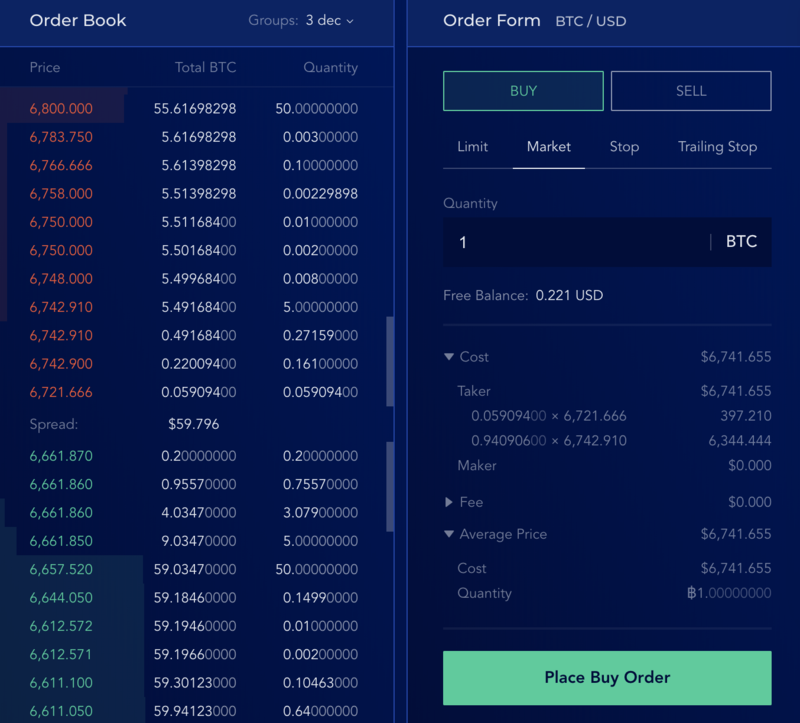 To choose Market order option, click Market in the Order Form. 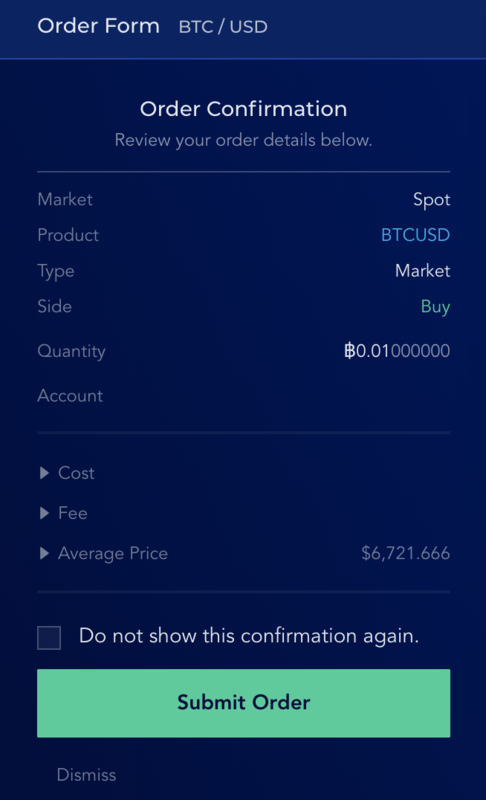 Below is a screenshot of the Order Form for a buy Market order, in BTC/USD pair. Funding currency in this case is USD by default. You will need to specify the quantity of BTC you're buying or selling. Cost, Fee, and Average Price will be estimated accordingly. Click Place Order. System will prompt you to review and confirm the details of your order again before actually sending it to the Order Book. Click Submit Order to confirm and go through with your order, or Dismiss to go back and change some details. In below screenshot, we're buying 0.01 BTC with a Market order. Average Price is $6721.666, the same as ASK (see Order Book). This is because the quantity of the order can be fully covered by the best offer on the ASK side at this moment (0.059094 BTC at $6721.666). In this screenshot however, when we change Quantity to 1 BTC the Average Price is no longer the best price on the market. This is because Average Price is actually median price of all orders that will be matched against our 1 BTC Market order. See how Average Price is calculated by expanding the Cost. This is also an example of slippage, when the price of an order is greatly affected by its quantity.